Toxicological Analysis of Victims' Blood and Crime Scene Evidence Samples in the Sarin Gas Attack Caused by the Aum Shinrikyo Cult. Outlines of Sarin Incidents caused by AUM SHINRIKYO. Matsumoto Sarin Incident. The first sarin gas attack occurred in a quiet residential area of Matsumoto City, at midnight June 27, 1994. At 11:30 p.m.　Matsumoto Police station received an urgent report from an ambulance team of the City Fire Defense Bureau that some patients were transported to a hospital. The cause of injury was not clear. The Nagano Prefecture Police Headquarters immediately started to rescue the injured and conduct investigations. Five deceased residents were discovered at the site and two victims who had been injured and hospitalized subsequently died. About 270 people were treated in the hospital. Carcasses of dogs, sparrows, a dove and a large number of caterpillars were found in the area under some trees. In addition, discolored grass was observed in the garden, and dead fish and crayfish were found in a nearby pond. Nearly all casualties were discovered in a sector-shaped residential area within a radius of 150 meters from the center near the pond. Persons near open window or in airconditioned rooms were severely affected. Some victims observed a slow-moving fog with a pungent and irritable smell. Typical symptoms of the victims were darkened vision, ocular pain, nausea, miosis and severely decreased serum cholinesterase (ChE) activities. Autopsy findings showed intense postmortem lividity, miosis, pulmonary edema, increased bronchial secretion and congestion of the parenchymatous organs. Tokyo Subway Sarin Incident. Sarin mass terrorism occurred inside trains on three Eidan-subway lines during the morning rush-hour peak on March 20, 1995. Passengers and station personnel were overcome by fumes in the train cars, as well as within Kasumigaseki and Tsukiji stations. The Tokyo Metropolitan Police Department immediately began to rescue the injured, to conduct traffic control and to investigate the incident. Evidence samples, such as containers, newspapers and other remains were collected, and the Forensic Science Laboratory identified sarin by gas chromatography-mass spectrometry (GC/MS) in a short time. This conclusion was possible because of our previous experience in the Matsumoto Incident. The cult decided to use sarin in trains on the three subway lines, all of which stop at Kasumigaseki station near the Metropolitan Police Department. Twelve passengers and station personnel were killed, and approximately 5000 people were injured. Typical symptoms were darkened vision, ocular pain, nausea, miosis, hyperemia and nosebleed. Autopsy findings were nearly identical to those in the Matsumoto Sarin Incident. The sarin manufacture case. Sarin was manufactured in the Cult facilities in Kamikuishiki, Yamanashi Prefecture near Mt. Fuji. On 1994 July, inhabitants in the vicinity of a cult facility noticed some foul smells. Later, a sarin hydrolysis product was detected from a soil sample taken near the site. Furthermore, police seized evidence which showed that cult dummy companies had purchased a large quantity of the raw materials for manufacturing sarin. On March 22, 1995, a simultaneous raid of the cult facilities was launched by 2500 police personnel in connection with the confinement of the notary public manager to death. The search uncovered a large amount of chemicals such as phosphorus trichloride, as well as a chemical plant in No. 7 Satyam building. Nearly all the cult perpetrators were arrested within two months. In the chemical plant building, various types of equipment required for the manufacture of chemicals were found. Through the investigation of the plant facilities, the police concluded that a very strong suspicion existed for the construction and operation of the plant used to produce sarin. Laboratory techniques performed in forensic investigation. The special nature of nerve gases restricted police efforts for an early solution. First, nerve gases are objects of The Law on the Ban of Chemical Weapons and the Regulations of Specific Substances, which was enacted in May 1995 in Japan, but only after the attacks occurred. Second, nerve gases are highly toxic, and lethal in trace amounts. Handling of samples requires caution, and it is difficult to detect nerve gases because of rapid evaporation. Fourth, nerve gases are chemically labile and easily hydrolyzed to alkylmethyiphosphonate. In order to verify nerve gas exposure, it is necessary to identify the degradation products, rather than the nerve gas instead. However, sarin is toxic at very low levels and covalently binds to hydrolytic enzymes, therefore it is difficult to detect isopropylmethyiphosphonate (IMPA) in the blood of a victim. The detection of free IMPA or sarin, liberated from a ChE adduct, may be useful for the verification of sarin poisoning. However, a decrease in blood ChE activity remains the index of sarin exposure. We performed toxicological analysis of crime scene evidence samples. First, we carried out ChE assays on victim's blood samples. We then carried out chemical analysis of victim's blood, water, soil and wipe samples, by organic solvent extraction and GC/MS. The analytical system used in our forensic investigation makes it possible to detect trace levels of toxic substances, and also provides chemical proof for usage, possession and production of chemical warfare agents. Chemical analysis. In water, nerve gases are easily hydrolyzed, producing characteristic methyl phosphorus bonding compounds which are metabolically stable, water soluble and never found in nature. These alkylmethylphosphonates are unique for the original nerve gases. They are ultimately hydrolyzed to methyiphosphonic acid (MPA). Therefore, detecting the hydrolysis products can provide indirect proof for the existence of nerve gas. Samples wiped with cotton were extracted with dichloromethane and then with water. After the water fraction is adjusted to a neutral pH, both the dichloromethane and water fractions are combined, and again shaken. Soil samples were extracted with water and then with dichloromethane. Blood samples were deproteinized with perchloric acid, and the resulting supernatant were adjusted to a neutral pH, and extracted with dichloromethane. Nerve gases and their intermediates and byproducts are extracted into the organic solvent fraction, and after concentration under mild conditions, subjected to GC/MS. The hydrolysis products of nerve gases are extracted into the aqueous fraction, and after derivatization, subjected to GC/MS. Compounds in the organic solvent fraction can be simultaneously separated using apolar DB-5 capillary column and by multi-step temperature program starting from an oven temperature of 45 ℃. Two types of GC detections are typically used. MS with electron impact ionization (EI) and isobutane chemical ionization (CI) provides both chemical and structural information. Atomic emission detection is highly selective for monitoring phosphorus-containing compounds. Molecules in the cavity are degraded to their elements and the atomic emission can be detected under selected wavelength. 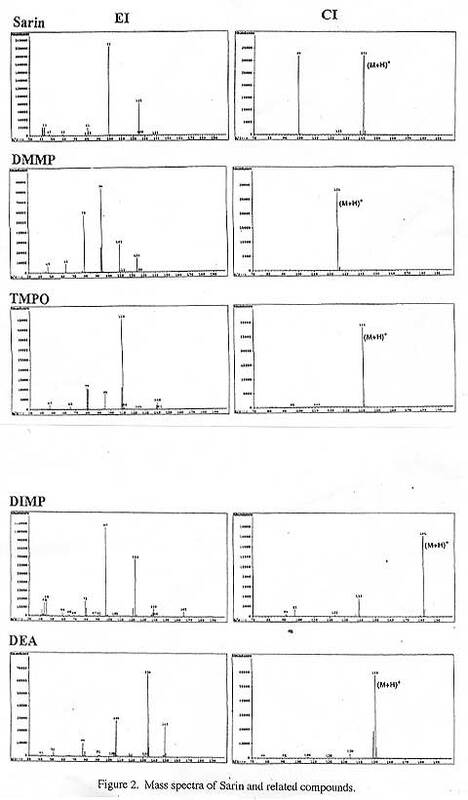 Figure 1 shows total ion chromatogram of 300-900 ppm of sarin, dimethylmethylphosphonate (DMMP), trimethylphosphate (TMPO) and diisopropylmethylphosphonate (DIMP). 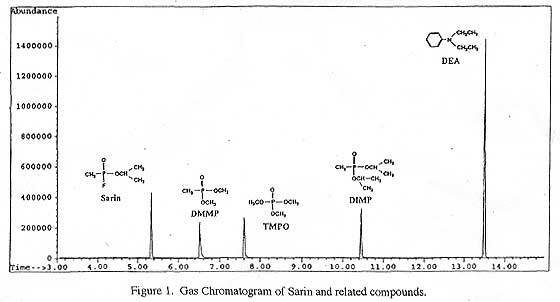 Figure 1,Gas Chromatogram of Sarin and related compounds. The later three are typical precursors or byproducts of sarin synthesis. EI-mass spectra offered representative fragmentation patterns and CL-mass spectra gave quasi-molecular ions as base peaks (Figure 2). Figure 2,Mass spectra of Sarin and related compounds. Hydrolysis products of nerve gases in the aqueous fraction are obtained by evaporation of the water, and N-methyl-tert.-butyldimethylsilyltrifluoroacetamide and acetonitrile are added, heated and injected into the GC/MS (13). Figure 3 shows a total ion chromatogram of tert.-butyldimethylsilylated hydrolysis products (30-45 ppm) of nerve gases, ethylmethylphosphonate (EMPA) from VX agent, IMPA from sarin, pinacolylmethylphosphonate (PMPA) from soman, and MPA. The mass spectra offered representative fragmentation pattern on El-MS and quasimolecular ions on CL-MS (Figure 4). Matsumoto Sarin incident. Sarin was detected in one sample of the pond water, and also in the nasal mucosa of one victim. This represents the first case where sarin is detected in a sample from a victim. We have no authentic "sarin" as a standard. However, observed retention index (817) is very similar to values quoted in the literature. The El-mass spectrum was also identical to previously published data. The CI-mass spectrum gave quasimolecular ions of m/z 141. Furthermore, one peak was observed under atomic emission detection with a phosphorus emission line near the position of the retention index of 817. IMPA and MPA were detected in numerous samples from victim's blood, as well as wipe samples. In addition, from the discolored blades of grass, a high level of fluoride and chloride was identified by capillary electrophoresis. Allegedly, the perpetrators sprayed the lethal gas from evaporator-type spray containers. They fabricated the spraying device by modifying a refrigerator-car, which contained a heating-pot and fan. In the Cult chemical plant, sarin was produced by adding isopropyl alcohol to a mixture of methylphosphonyl difluoride and methylphosphonyl dichloride. Because the reaction conditions were in error, the yield of sarin was low, and by-products were produced. After storage for nearly 3 months, this solution was released by evaporation with forced heating over a 10 minute period. High levels of sarin hydrolysis products were detected from even injured victims, and high levels of DIMP were also detected. This suggests that the sarin solution was composed of not only sarin itself but also the other sarin synthesis precursors and byproducts. Tokyo Subway Sarin Incident. Sarin-containing vinyl bags were used for mass terrorism. The perpetrators boarded subway trains with these plastic bags, and released the gas by puncturing them with the metal tips of umbrellas. Sarin, n-hexane and N,N-diethylaniline (DEA) were identified as major components from a sarin bag which was obtained at the scene. IMPA was detected in blood samples from only two victims. Allegedly, in the Cult chemical laboratory, sarin was produced by adding isopropyl alcohol to 1.4 kg of methylphosphonyl difluoride, using n-hexane as solvent and DEA as the acid neutralyzer. The resultant solution, about 7 liters, was divided into 11 bags. From forensic investigation, the concentration of sarin was determined to be about 30%, and this value is supported by the testimony of suspects. Sarin manufacture case. From the police investigation of the chemical plant, synthetic route of sarin mass manufacture was disclosed. The protocol was comprised of 5 stages. 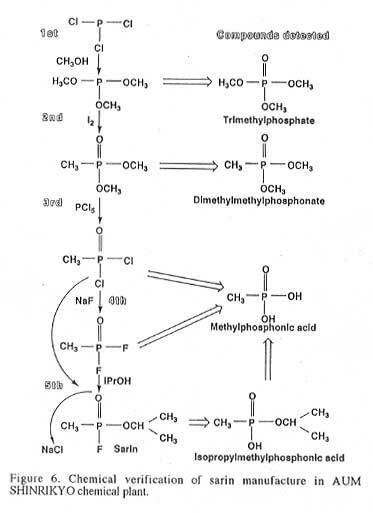 In the 1st stage, phosphorus trichloride was reacted with methanol to produce trimethylphosphite. In the 2nd stage, trimethylphosphite was converted to DMMP via a thermal rearrangement reaction. In the 3rd stage, DMMP was reacted with phosphorus pentachloride with heating, to produce methyiphosphonyl dichioride. In the 4th stage, methyiphosphonyl dichioride was reacted with sodium fluoride to produce methyiphosphonyl difluoride. In the final stage, methyiphosphonyl difluoride and methyiphosphonyl dichioride were mixed with isopropyl alcohol to produce sarin. From the wiped samples taken from the 1st stage equipment, TMPO, n-hexane and DEA were detected. From the 2nd stage equipment, TMPO, DMMP, iodine and DEA were detected. From the 3rd stage equipment, MPA, DEA, phosphorus oxychloride and sodium chloride were detected. From the 4th stage equipment, MPA, DEA, sodium chloride and sodium fluoride were detected. From the final stage equipment, IMPA, MPA, DEA, DMMP and sodium chloride were detected. As shown in Figure 6, from the chemical analysis of evidence samples taken from the scene of manufacturing plant, stable substances derived from the precursors and the products and byproducts corresponding to synthetic routes, have been identified, which provides both evidence and verification of sarin synthesis by the Cult. Figure 6, Chemical verification of sarin manufacture in AUM SHINRIKYO chemical plant.